Isolated atrial septal defect (ASD) is the most common congenital heart disease in adults. Based on the location of the defect four types are described with ostium secundum ASD being the commonest and coronary sinus (CS) type of ASD the rarest. Majority of patients with ASD remain asymptomatic in childhood even when the left to right shunt is substantial (Qp/Qs > 2:1). In adulthood however, patients become symptomatic with exertional dyspnea and fatigue. In addition palpitation, due to atrial flutter and fibrillation occurs with increasing frequency. Atrial septal defect provides a communication between two low-pressure atrial chambers. Flow across a restrictive ASD is mainly determined by the size of the defect while in a large nonrestrictive ASD it is determined by the relative compliance of the ventricles. Even with elevated pulmonary artery (PA) pressures, ASDs continues to shunt left to right till late in the course and result in late presentation compared to Eisenmenger syndrome due to a large ventricular septal defect or PDA. Many cardiologists even believe severe pulmonary arterial hypertension (PAH) in patients with ASD may be partly representing a spectrum of primary PAH and is not a true Eisenmenger syndrome. Cyanosis in patients with ASD is uncommon. Cyanosis in the setting of elevated pulmonary vascular resistance (PVR), better known as Eisenmenger syndrome is well-known and precludes closure of the ASD. On the other hand, cyanosis in some of these patients is not related to high PVR and unlike Eisenmenger syndrome these patients can undergo closure of ASD with good outcomes in the majority. 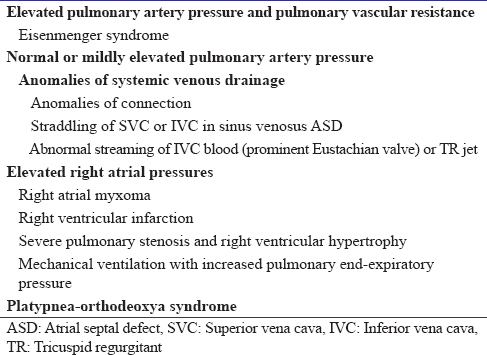 Based on the PA pressure and PVR these causes are shown in [Table 1]. Elevated PA pressure and PVR hampers the flow across the pulmonary vascular tree and alters the RV compliance unfavorably resulting in restriction of left to right shunt or reversal of the shunt in some. Occasionally systemic veins instead of connecting to the RA drain to the LA. These abnormal connections allow systemic venous blood to reach LA irrespective of the PVR unlike in patients with Eisenmenger syndrome. This constant nature of the shunt is sometimes labeled as an obligatory shunt and accounts for constant desaturation. Persistent left superior vena cava (SVC) to LA either directly or through unroofing of CS is the most common among these anomalies. Rarely SVC and/or inferior vena cava (IVC) connect anomalously. Total anomalous systemic venous connection is an extremely rare condition when all three systemic veins, that is, SVC, IVC and CS drain to LA. SVC and IVC are known to straddle across a deficient ASD The cyanosis in these patients with sinus venosus type of defects, however, is rare owing to the left to right shunt in the majority. Eustachian valve, an embryonic structure that facilitates IVC flow to reach LA, if prominent can also contribute to anomalous drainage of IVC to LA despite normal connection to the RA allowing right to left shunt and consequently cyanosis to occur. Similarly, in an occasional patient the regurgitant jet of the tricuspid valve is directed toward the septal defect to allow blood from RV to enter into the LA causing cyanosis. The flow across a large, nonrestrictive ASD is determined by the flow across tricuspid valve which in turn depends upon the compliance of the right ventricle. Left to right shunt across ASD is impaired in cases with RA myxoma due to mechanical obstruction to the tricuspid valve inflow. On the other hand, reduced RV systolic function in cases with RV myocardial infarction, RV cardiomyopathy and diastolic dysfunction in patients with pulmonary stenosis poses functional obstruction to the tricuspid valve inflow and in turn impairs flow across ASD. Occasionally, when this impairment is severe flow across an ASD reverses resulting in cyanosis. In addition, a patient of ASD on positive pressure ventilation rarely can have right to left shunt owing to elevated RA pressure secondary to high end expiratory pressure. In summary, cyanosis in patients with ASD is uncommon yet an important clinical finding. The presence of cyanosis does not always mean the existence of Eisenmenger syndrome and identification of causes of cyanosis without PAH is important for the appropriate management in patients with ASD. Gallaher ME, Sperling DR, Gwinn JL, Meyer BW, Fyler DC. Functional drainage of the inferior vena cava into the left atrium - Three cases. Am J Cardiol 1963;12:561-6. Cheng TO. Mechanisms of platypnea-orthodeoxia: What causes water to flow uphill? Circulation 2002;105:e47.